If you have naturally curly or wavy hair you may have considered ways to straighten your locks at home. Many individuals with curly hair strands wish to wear hairstyles that require the straightest of strands but are unsure of how to achieve the look necessary to pull it off. For at-home treatment there are two main options- manual straightening and chemical straightening. There are two main ways to manually straighten your hair at home. You can choose to use a straightening tool or you can blow-dry your hair into a straight hairstyle. If you choose to blow-dry your hair strands straight you will need to keep a few things in mind. First the extreme heat from the blow dryer can be damaging to your hair. 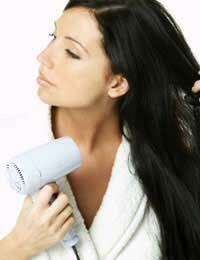 If you are using a blow dryer your best option is to set the temperature on the lowest effective setting and keep the dryer moving over your hair at all times. If you concentrate the heat on one area of your hair for too long of a time you will risk damaging the strands and burning your scalp. Another thing to remember when blow-drying your hair straight is that you will need to use a soft bristled hairbrush while drying your hair. When the hair strands are heated by warm air they expand and are more susceptible to breakage. Make sure that your hairbrush moves through your hair easily without pulling, only work on a certain section for 3 to 5 seconds at a time, and hold the blow-dryer at least 12 inches away from your hair at all times. Depending on your hair length, texture, and thickness, you should see straightened hair strands within 20 to 45 minutes when using this technique. If you choose to use a hair-straightening tool you can enjoy results faster but there is a greater chance of damaging your hair. Hair straightening tools usually come in one of two choices of material- metal plates or ceramic plates. The plates are the part of the tool that heats up and when applied to your hair results in a straightening of the hair strands. How you choose a plate style will depend on your hair texture, length, health, and desired results. Metal plate hair straighteners use metal in the construction of the heating element that straightens your hair strands. Since the surface is not as smooth as that found on ceramic straighteners, these tools could sometimes grab onto hair strands and cause breakage, weakening, or other strand damage. Also, the metal plates do not conduct heat as evenly and can sometimes burn or "fry" small areas of the hair during use. If you choose to use a metal straigthener you will want to treat your hair with a heat protective spray before straightening. Ceramic plate straighteners are made with a ceramic alloy that uses infrared heat to smooth out curls. These tools distribute heat more evenly and provide a smoother surface for hair strands to glide over. While this type of straightener is less likely to damage hair strands you still need to use proper hair straightening techniques to avoid unwanted breakage or hair loss. No matter which type of straightener you prefer, you will want to choose the style that is right for your hair and use the tool correctly. If you have very thick, very long, or extremely curly hair you will want to choose a straigthener with a large plate surface and a wider range of higher temperature settings. For fine hair, hair that is just wavy, or very short hair, you will need a small plate straigthener that includes lower temperature settings. If the idea of straightening your hair everyday, or having to repeat the process each time it rains, has you avoiding manual straighteners, you may want to look into chemically straightening your hair at home. The benefits to this technique include a more permanent look, and a lower cost when compared to professional straightening. However, the process can have a downside. At home chemical straightening has been known to cause skin and eye irritation, extreme drying of the hair strand, scalp burns, hair breakage, and premature balding when used improperly. In order to avoid these hazards there are a few things you need to know about chemical straightening. First, chemical straigtheners contain harsh chemicals that work to permanently straighten the hair strands. When choosing a formulation you should pick the straigtheners with the least amount of chemicals required for your hair type. For example, individuals with thin, wavy, or short hair can choose a product with mild chemicals since their hair will be easier to straighten. Second, never leave the product on your hair for longer than the recommended time. If your hair does not become straight after the preferred processing time, you will still need to wash the product out. Then, you will need to choose a stronger product for the next round of straightening. Finally, never apply a chemical straigthener to weak, unhealthy, permed, coloured, or over-processed hair without first consulting with a hair professional. Unhealthy hair is more susceptible to damage from the chemicals and will require a different technique and milder applications.